I hope you enjoyed the vlog yesterday, cheesy smile included! I received quite a bit of peer pressure to sing, but the thought of singing to my laptop or phone feels... very odd! Maybe I'll have one of the other bridesmaids record "At Last" at the wedding reception next month. And maybe I'll post it. Maybe. I'm contemplating recording a Disney song as an (not-so-surprise anymore) audition video for Jamie to be Sabrina's "Mary Poppins" (her singing nanny). More importantly, I'm picking up the keys to the new place today after work! WAHOO! I was going to take a blogging break due to time, but I realized that I never shared Part 2 of My DIY Wedding on my blog, because it was originally posted at 5ohWifey on March 8! If you read my guest post over there, feel free to skip this. I won't mind! If you're a new reader, enjoy! You can find all of my past wedding posts HERE. Enjoy your day, my peeps (as Mr. TBS and I like to say, because we're gangsta). My sister is the crafty one of the children. She put all of these individualized s'mores packs together by herself! She used clear craft bags, graham crackers, Hershey's chocolates, large marshmallows, and cute printables! 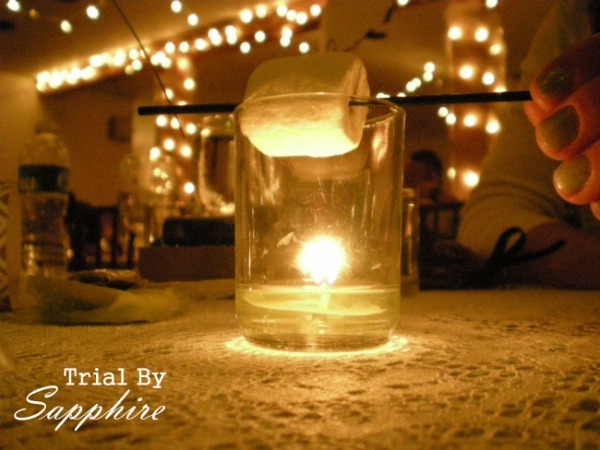 They were so tempting that a lot of people starting roasting their s'mores over votives! Tasty and personalized! Who needs to buy vases and votive candle holders when you can make them? For months, family members saved baby food jars, large glass jars, and glass bottles for us. After washing, soaking, and removing all labels and adhesive, we had a collection of about 70 to decorate. 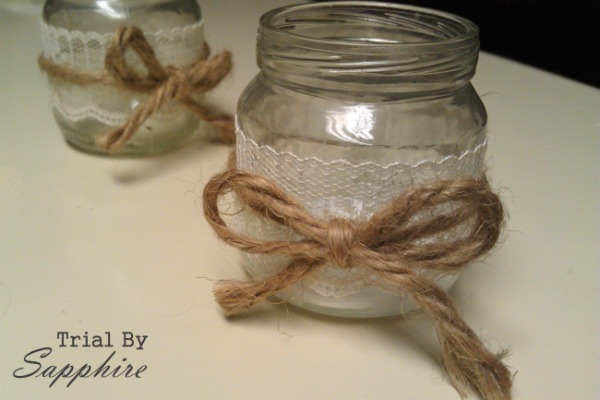 Using a hot glue gun, we decorated them with ribbon, twine, and lace -- and voila! They were perfect for our centerpiece flowers! The baby food jars held votive candles. Since tea lights would only last for 1-2 hours, I wrapped votive candles in foil so they wouldn't melt into a large pool and burn out quickly. 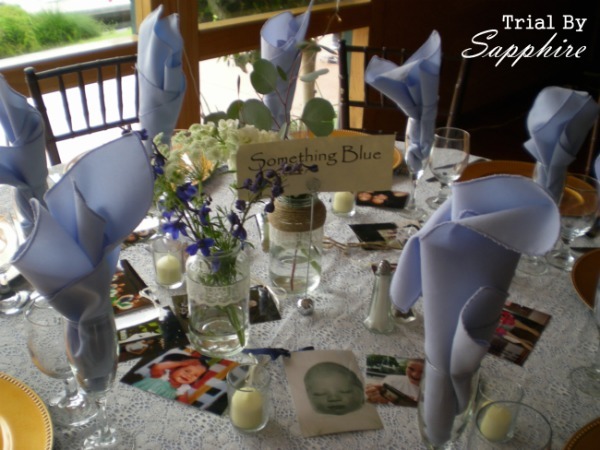 We placed 15 pictures decorated with twine and ribbon on each table. They included photos of us growing up and pictures of our 4.5-year relationship together. These were a hit with our guests! Every table had different pictures, and this encouraged people to mingle. They depicted a lot of wonderful memories with friends and family, so we weren't surprised that our guests took their favorites home with them. And after some deal hunting, our photo printing was 50% off through Walgreens! 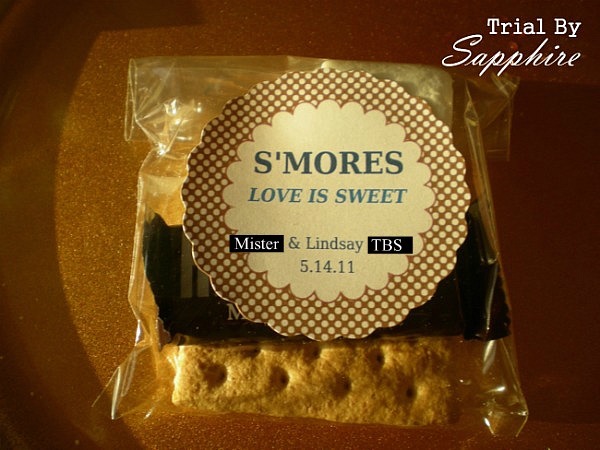 The S'Mores idea is so perfect, I love it! Thank you for sharing all of this, the touches of blue are also so sweet and simply elegant. Oh my! I love the smores idea! I'm totally saving this link for my wedding inspirations! I love the smores! Great idea!!!! I just had requests to sing on my blog... you should TOTES do it too!! Or one day we can sing a duet!! When do we get to see pictures of the new place?! PS - I think that "maybe" having you recorded should be turned into a "definitely" having you recorded. those smores are SO cute! So I can't wait to watch the audition video LOL!